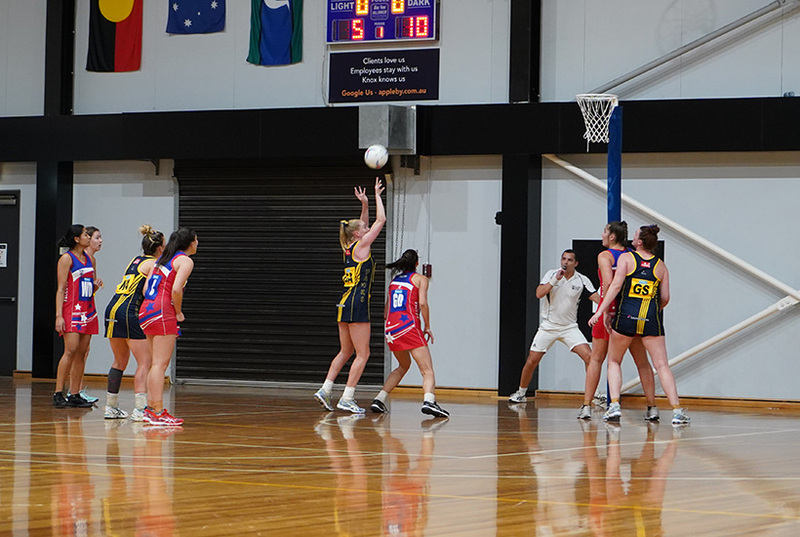 Hawks Netball Club’s Championship division team has come up just short in a high-scoring and entertaining Round 1 Victorian Netball League clash against 2018 premiers City West Falcons. In what was a rematch of last season’s elimination semi-final, the game again went Falcons’ way, with their goal shooter Jane Cook proving difficult to stop under the post and helping her team rack up 68 goals for the match. The Hawks managed 57 themselves – including 32 in the second half – and remained in touch throughout, but with Falcons adding 16 goals in the third quarter and another 17 in the last, the task was too great for the new-look Hawks outfit. Former Hawks goaler Shae Gee made her return to the VNL court in the second half and didn’t miss a beat, while veteran Lauren Bennett looked right at home at wing attack, in what was her first VNL game since 2012. Hawks vice-captain Tayla Shannon said the second quarter was costly, with Falcons taking their lead beyond 10 goals after the Hawks trailed by just three at quarter-time. “The second quarter was where we let them get away, with a few lapses in concentration that were punished with the precision of passes by City West into their tall GS,” Shannon said. Shannon said there were plenty of good signs in the performance. “We were faced with Round 1 being against the reigning premiers and it was never going to be an easy battle, but we we showed some exciting glimpses for the 2019 season and an improved margin from when we played them in the 2018 finals series,” she said. “We can take a lot of positives out of the game, with a number of swift passages of play, whole court defence and quick passes through Falcons’ zone defence. The Hawks now face another tough assignment in Round 2 on Wednesday night as they take on the other 2018 grand finalist, Geelong Cougars. A dominant first half from the Hawks’ Division 1 team paved the way for a 33-goal win that has them sitting atop the ladder at the end of Round 1. In what was an all-court performance the Hawks piled on 22 goals in the second quarter while limiting the Falcons to just four, taking the upper hand defensively and converting clinically at the other end to establish a 37-12 half-time lead. Goal shooter Daisy Hill was in great touch from the outset, pouring in 14 goals in the first quarter and finishing with 34/40 for the match, while at the other end Division 1 debutant Sally Deller and goal defence Chloe Sinclair were ultra impressive, first quelling the influence of Victorian 19/U goaler Uneeq Palavi, and then towering 208cm Sri Lankan shooter Tharjini Sivalingam. The Hawks added another 23 goals to 15 in the second half to run out 60-27 winners, ahead of a 2018 grand final rematch against Geelong Cougars in Round 2 on Wednesday night. Two Hawks 19/under players also made their Division 1 debuts in Round 1, with Sophie Hennessey impressing after earning the start at wing attack, while Gemma Thomas had a big impact when injected at wing defence. A fighting five-goal loss for the Hawks 19/under team provided a glimpse of a very bright future for the young squad. 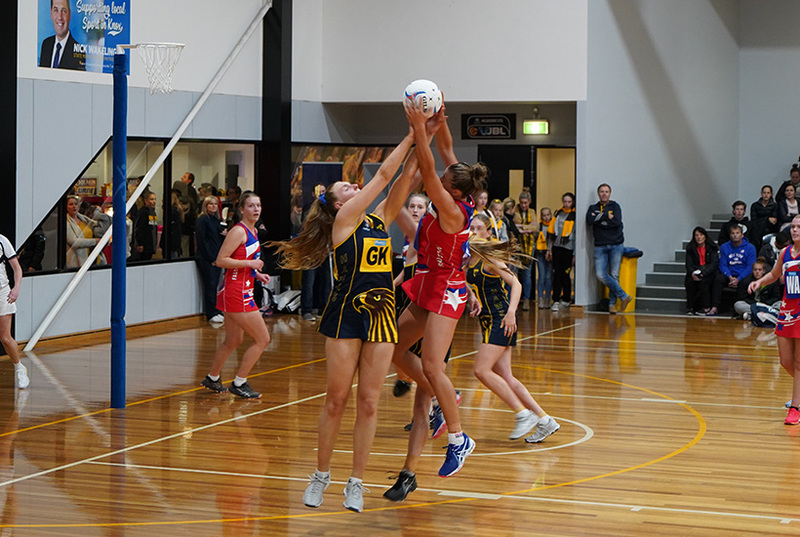 With five of the starting seven making their VNL debuts, the Hawks showed plenty of poise despite their inexperience, grabbing a 12-11 lead at quarter-time. The goals dried up in the second quarter, with Falcons limiting Hawks goalers Ellie Karaula and Hannah Keane to seven from 12 attempts while adding 13 of their own to lead 24-19 at half-time, though new defensive duo Olivia Spence and Gemma Thomas, along with wing defence Abi Inglis, came up with plenty of ball. The introduction of Olivia Morris into goal shooter at half-time had the desired effect, with the Hawks nailing 11 from 11, though the Falcons’ lead grew to six by the final change. The margin threatened to creep out in the final quarter but the Hawks refused to concede, making one last charge in the closing stages to narrow the margin to four goals inside the last two minutes. But time wasn’t on their side, with Falcons holding on to win 47-42. The Hawks play Geelong Cougars in VNL Round 2 on Wednesday at the State Netball Hockey Centre. No Replies to "HAWKS PUT IT ALL ON THE LINE IN VNL SEASON OPENER"